The two candidates in the 40th LD state representative (Pos. 1) race in the November 6, 2018, general election are: Democratic candidate Debra Lekanoff, and Republican candidate Michael Petrish. This is a follow-up story to that October 20 report that will shed light on Republican candidate Michael Petrish’s campaign funding relative to the contributions his campaign has received from William S. Doddridge, a major GOP donor. Doddridge co-founded the pro-Donald Trump Political Action Committee, “TrumPAC,” which was launched in January of 2016, funded with seed money he provided. Screenshot photo showing the top portion of The Seattle Times (online version) August, 8, 2016, article about William Doddridge’s campaign contributions to Republican political campaigns and organizations. The photo shown in the article is of William Doddridge, CEO of The Jewelry Exchange. This follow-up story will also shed light on the tens of thousands of dollars Doddridge has contributed to the Skagit GOP toward this year’s election, and the sizable donations he made to the No On Charter ballot committee created in opposition to (Proposition No. 1) on Skagit County voters’ November 6 ballots. Doddridge is the founder of Goldenwest Diamond Corporation, which does business as “The Jewelry Exchange.” He is CEO of The Jewelry Exchange, one of the largest diamond importers and manufacturers in the U.S., which also has retail stores in 15 markets nationwide. On March 11, 2016, veteran Republican political operative Jesse Benton, was hired to serve as the chief strategist for Great America PAC. Benton had previously overseen a super PAC supporting U.S. Senator Rand Paul (R-Kentucky), who ran for the Republican nomination at the 2016 U.S. presidential election. Benton also served as a top aide on U.S. Senate Majority Leader Mitch McConnell’s (R-Kentucky) reelection bid in 2014. On May, 5, 2016, Benton was found guilty of criminal conspiracy for campaign finance violations he committed during the 2012 presidential election. That conviction stemmed from when he was a political strategist for former U.S. Representative Ron Paul’s run for the Republican nomination at the 2012 U.S. presidential election. Ron Paul is the father of Senator Rand Paul. 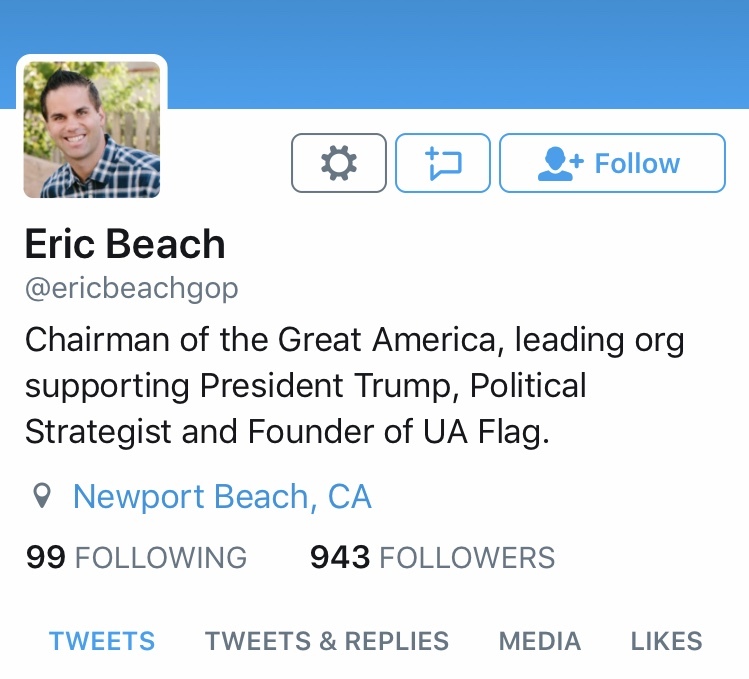 In early March of 2016, the Great America PAC also tapped Eric Beach, an Orange County, California-based Republican political strategist who had served as the national finance chair on Rand Paul’s presidential run, where he helped to oversee fundraising efforts for the group. Beach had served as national finance chair for the Tea Party Express as well. Presently, he is co-chair of the Great America PAC, along with veteran Republican strategist Ed Rollins. Beach’s name will pop up later in this follow-up article in terms of a donation he made pertaining to what would likely be for him, an obscure campaign in Skagit County’s November 6 election. 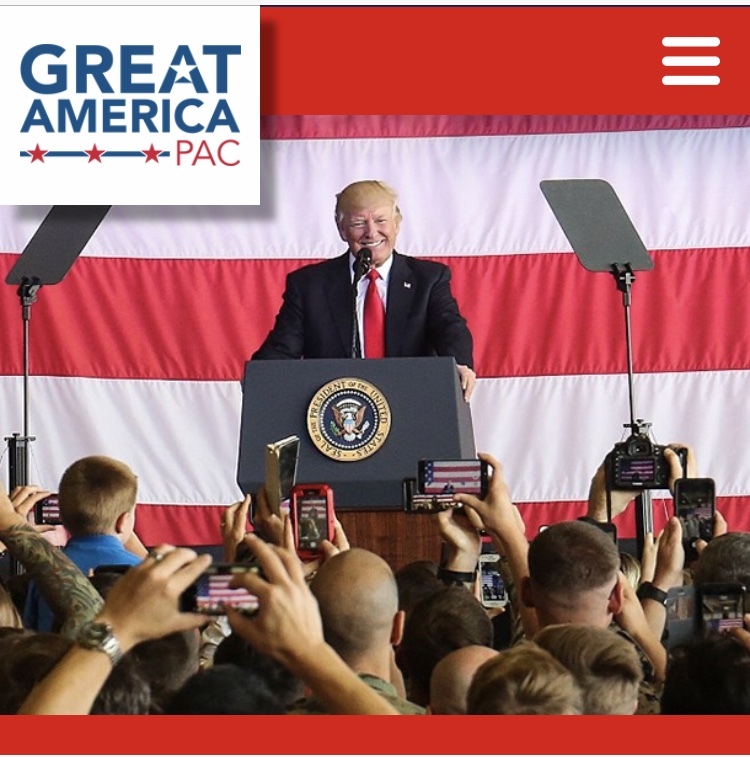 During the 2016 election cycle, the Great America PAC created in support of Donald Trump, raised approximately $28 million. The Federal Election Commission calls the Great America PAC a hybrid super PAC. Circling back around to William Doddridge, who has a penchant for making donations to Republican campaigns, and his relevance to Petrish’s campaign for state House Pos. 1, representing the 40th LD — while Doddridge’s business is based in Tustin, California, he purchased a home in Anacortes, Washington in December of 2012. According to Zillow’s now inactive/off market listing for the Anacortes address matching the listed address for Doddridge on the PDC C3 form, the property he purchased back 6 years ago sounds fit for a diamond king whose net worth is estimated to be somewhere around $250 million. An August 2016 Seattle Times article reported that Doddridge said since he spends more than half of his time residing in Washington, he changed his residency in 2016, so that he can vote here. The Seattle Times article also reported that after meeting with then-Republican gubernatorial candidate Bill Bryant in July of 2016, Doddridge donated $25,000 to the Washington State Republican Party. The party contributed hundreds of thousands of dollars to Bryant’s campaign. Bryant was running against Democratic Governor Jay Inslee, who was ultimately elected in that race. In an interview, Doddridge had told the Times that he hoped his campaign contribution would be used toward TV ads to stimulate Bryant’s campaign. In the 2017 election year, and, so far, in the 2018 election year, according to OpenSecrets.org, Doddridge has contributed over $62,000 to Republican congressional candidates. That figure does not include any potential contributions Doddridge may have made to PACs relative to federal politics in 2017 or 2018. 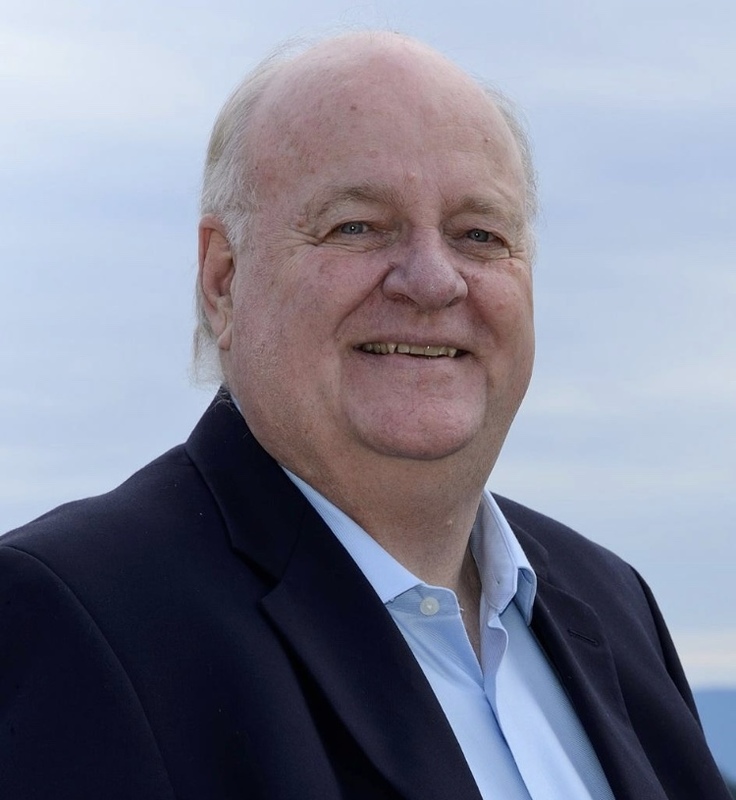 The Searchlight Review recently combed through Washington state Public Disclosure Commission (PDC) reports filed online by the Committee to Elect Michael Petrish, and filed online by the Skagit County Republican Bona Fide Political Party Committee (“Skagit Republican Party”). The 40th LD, which is the district Petrish is running within for state representative, encompasses northeastern Skagit County, southwestern Whatcom County and San Juan County. 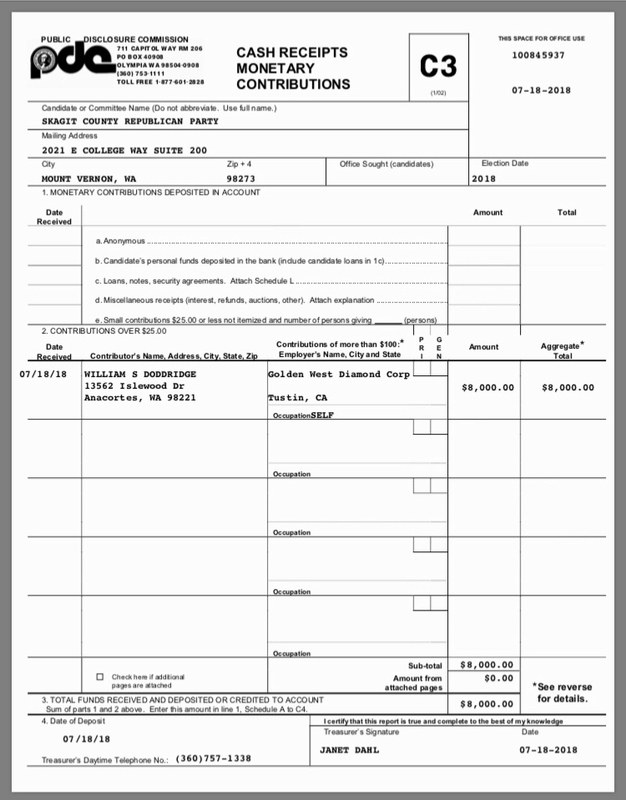 According to a C3 report (showing contributions) filed online with the PDC, William S. Doddridge, whose occupation is listed on the report as self-employed with “Golden West Diamond Corp.,” contributed $2,000 to Petrish’s campaign. 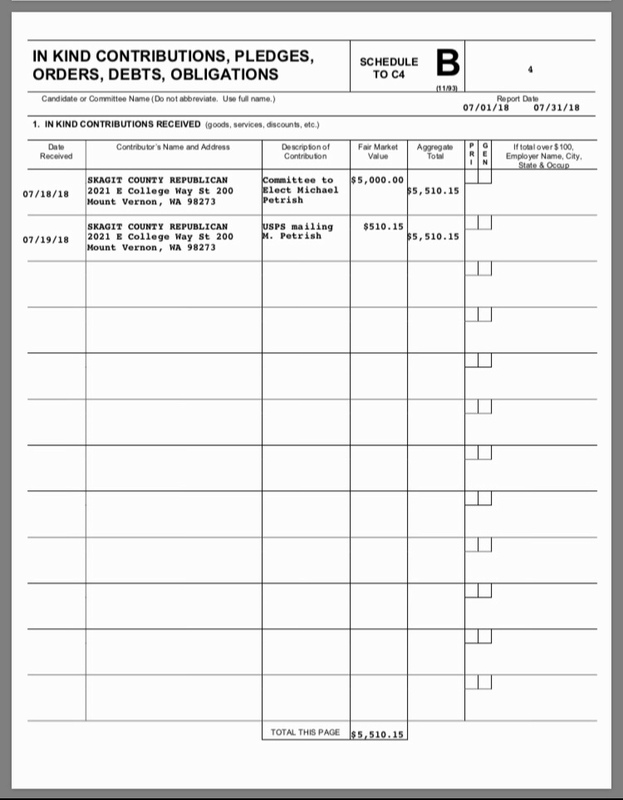 That aggregate amount was comprised of Doddridge’s initial $1,000 cash contribution that was received by the Petrish campaign on July 16, 2018, for the August primary, and an additional $1,000 cash contribution he made that was received on September 9, 2018, for the November general election. 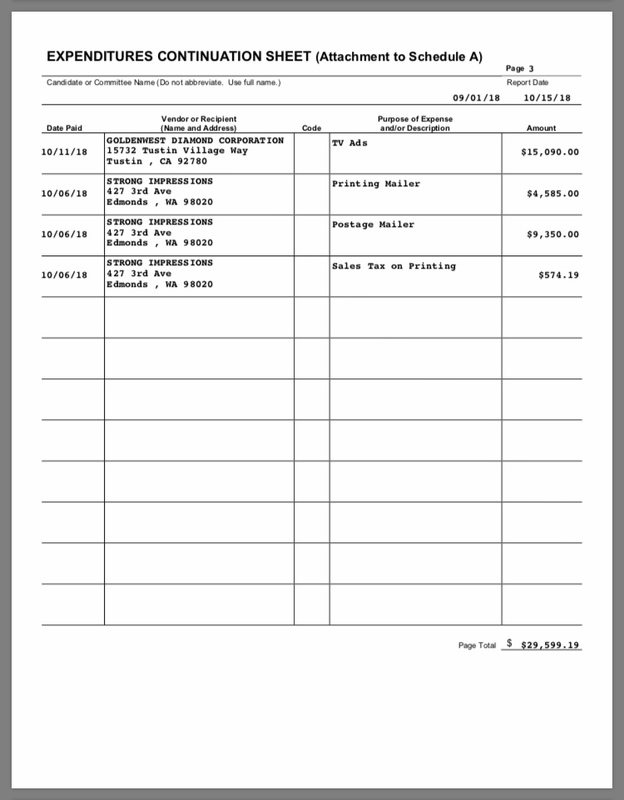 Reports filed online with the PDC also show there has been, so far, $1,350 in listed expenditures for “Google ads” and a “Debit card charge,” paid to Goldenwest Diamond Corporation by Petrish’s campaign. 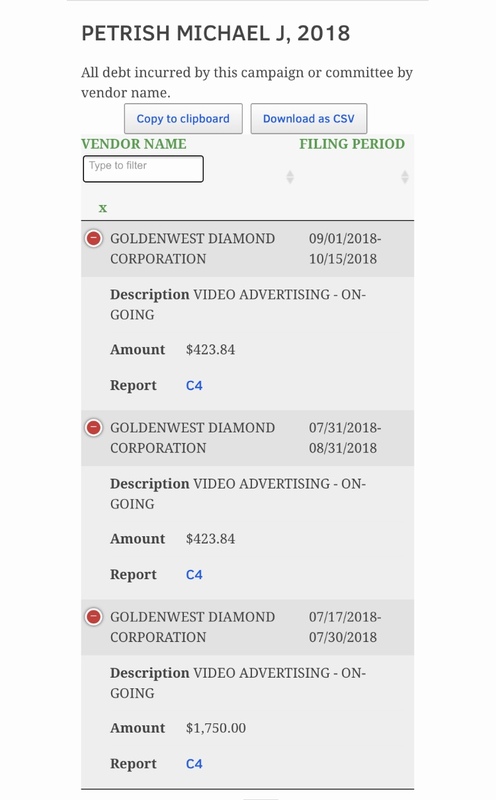 And, PDC reports filed online by Petrish’s campaign show there has been $2,474 in debt owed and/or in-kind contributions for “Video Advertising on-going” and “Video Content Creation,” for which the corresponding vendor or recipient’s name listed is Goldenwest Diamond Corporation. Screenshot photo of Bruce Ayers, treasurer for both the Committee to Elect Michael Petrish and for the No On Charter ballot committee. The photo is taken from Ayer’s profile picture used on his 2015 “Vote Bruce Ayers” campaign Facebook page when he ran unsuccessfully for Whatcom County Council (District 1). Seeking information on how Goldenwest Diamond Corp. can provide video advertising, Google ads, and/or video content creation services, The Searchlight Review left a message two weeks ago for the listed treasurer for the Petrish campaign, Bruce Ayers. The Republican operative, Ayers, who resides in Whatcom County, did not return the message. Along with Doddridge’s financial support to the Petrish campaign, PDC online contribution reports show that he has contributed, so far, a total of $23,000 to the Skagit Republican Party for the 2018 primary and general elections. Initially, Doddridge made a cash contribution of $8,000 to the Skagit Republican Party, which, according to PDC reports filed online, was received on July 18, 2018. The listed address for Doddridge associated with that particular contribution is his Anacortes address. The two contributions totaling $2,000 which Doddridge made directly to the Petrish campaign represent the full extent of the dollar amount an individual or business is legally allowed to contribute to a candidate’s campaign as stipulated by Washington state’s campaign finance rules. However, there is no limit to the amount of money individuals and businesses can contribute to a PAC, a Bonafide Political Party Committee, a Caucus Committee, or to a Ballot Committee. By contributing to PAC’s, Caucus Committees, Bonafide Political Party Committees, and to Ballot Committees, individuals and businesses are afforded a path for all of, or part of, their limitless donations to be steered into candidates’ campaigns. According to PDC online contribution reports, the Skagit Republican Party also received a $5,000 cash donation from Doddridge on August 7, and received another $10,000 cash contribution from him on October 9. 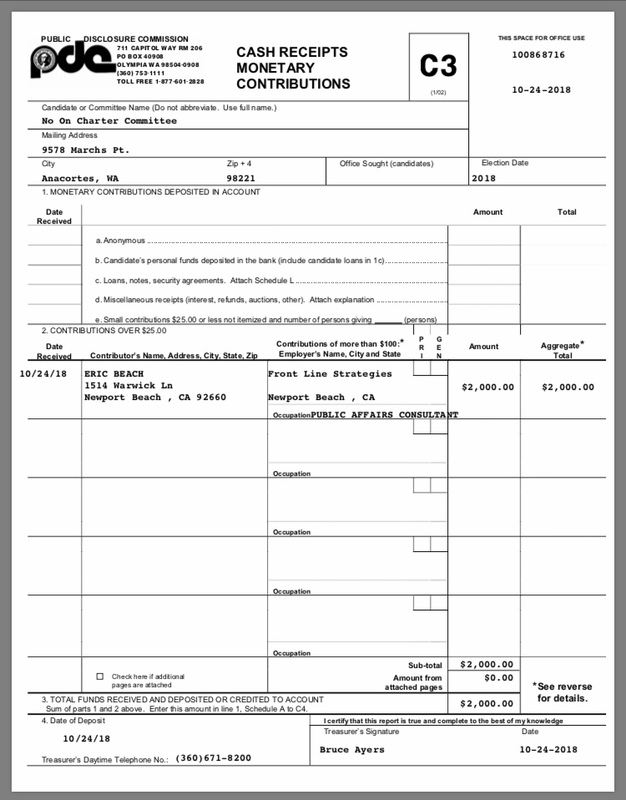 So far, these funds however, do not appear to have been relayed to Petrish’s campaign as had occurred with the bulk of Doddridge’s July 18 donation. 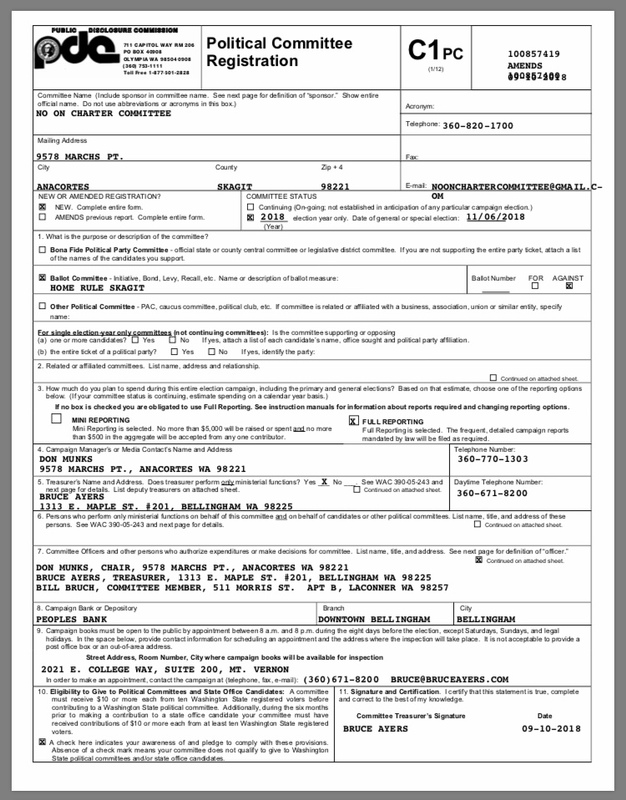 The C3 report filed online for that $10,000 contribution to the Skagit Republican Party lists the name “Bill Doddridge.” The address listed for Doddridge on the report is “Main Tustin, CA 90000.” The Jewelry Exchange, located in Tustin, California, is the company’s flagship jewelry store. Besides having contributed $2,000 directly to Republican Michael Petrish’s campaign, and $23,000 to the Skagit Republican Party (a portion of which was relayed to the Petrish campaign), TrumPAC founder William Doddridge has also contributed $12,000 to the “No On Charter” ballot committee. The ballot committee was created to oppose a local ballot measure, Proposition No. 1 that appears on Skagit County’s November 6, general election ballot. 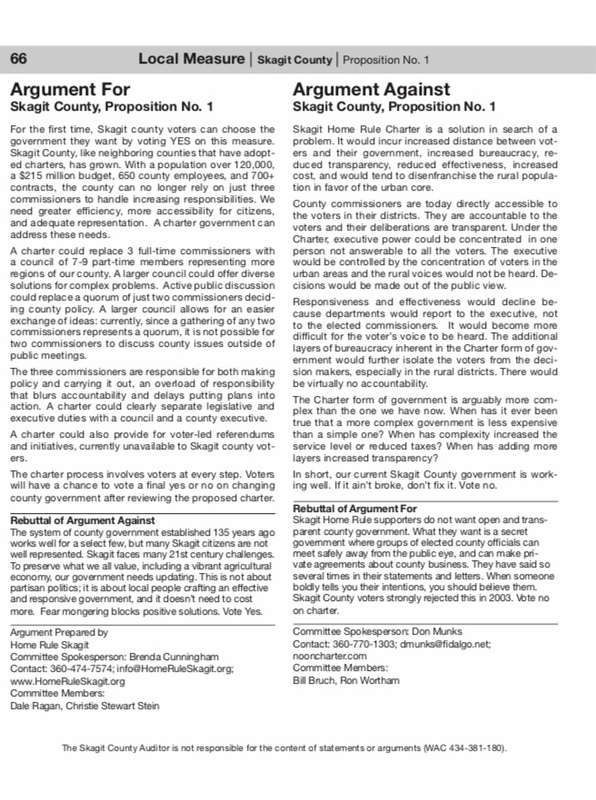 Skagit County voters will be voting on Proposition No. 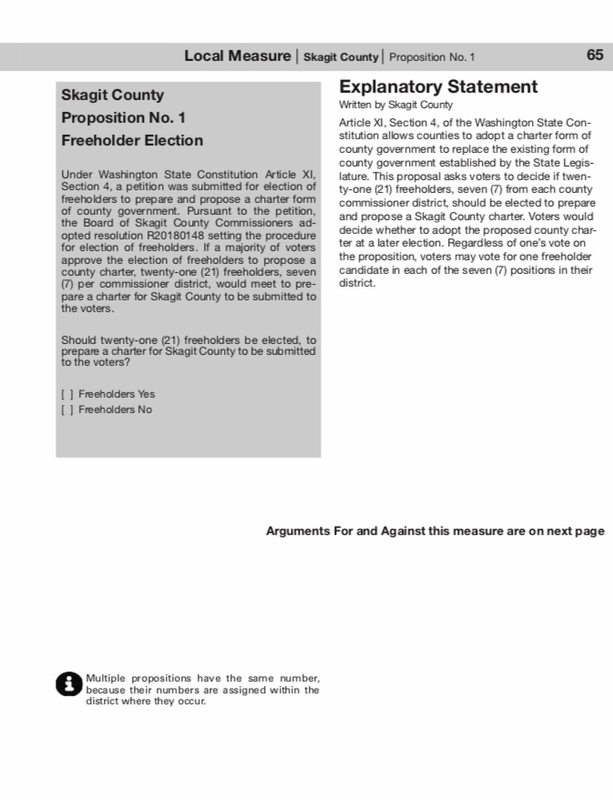 1 which seeks the creation of a Skagit County charter. A County Charter is essentially a County constitution. Skagit County voters will decide on whether the process of creating a charter should take place, and vote on who would be elected to participate in writing the charter. A ballot committee named Home Rule Skagit was founded in support of the creation of a County charter. Home Rule Skagit has raised over $20,000, almost all of which, comes from individual donors of which there are more than 80. There is one listed donation of $50 by a business, and one donation of $1,000 that came from the Swinomish Indian Tribal Community. As of today’s date, the committee has spent over $20,000 in support of the creation of a charter government. So far, the No On Charter ballot committee has received over $58,000 in contributions, from businesses, Republican Party organizations, a property rights advocacy group, and approximately 18 individuals one of whom is Doddridge. Another one of those individual donors is Eric Beach, mentioned earlier, who is presently the co-chair of the Great America PAC. According to PDC reports filed online, the No On Charter committee received a $2,000 cash contribution from Beach on October 24, 2018. As of today’s date, the No On Charter ballot committee has spent over $54,000 on the campaign against the creation of a charter government. One of the expenditures listed was for $15,090 for “TV ads” paid on October 11, to Goldenwest Diamond Corp. This week, The Searchlight Review reached out via telephone and spoke with all three committee officers listed on the No On Charter ballot committee’s C1pc registration form filed with the PDC: Chair Don Munks who is also listed as campaign manager and/or media contact, Bruce Ayers who is also listed as the committee’s treasurer, and Bill Bruch who is listed as a committee member. Bruch is also the current chair of the Skagit County Republicans. When asked if the $15,090 listed expenditure for “TV ads” paid by the No On Charter committee to Goldenwest Diamond Corporation on October 11, was payment for video production work done, Bruch, Munks, and Ayers were unsure. Munks explained that “there were seven or eight of us at the No On Charter meetings” and those meetings were primarily about planning the advertising for the campaign in terms of any mailers, TV ads, radio ads, and newspaper ads. He added, “I never did know how much money was going to what.” Munks said Ayers was usually not at those meetings. According to Munks, Bill Doddridge and his wife were present at about 4 or 5 of those meetings. Munks said that Doddridge told them he had a production team that his company uses that could do the video production. Munks went on to say that Doddridge “brought the production team to Mount Vernon,” and filmed numerous videos for the No On Charter committee to use in its campaign against the creation of a County charter. When asked who makes decisions about how the ballot committee’s contributions are spent, Munks told The Searchlight Review that would probably be Bill Bruch, along with each person who would be in charge of a particular advertising medium such as radio, TV, etc. For TV ads, Munks said that was Bill Doddridge, as Doddridge had told the meeting attendees that he would spearhead the TV portion of the advertising. 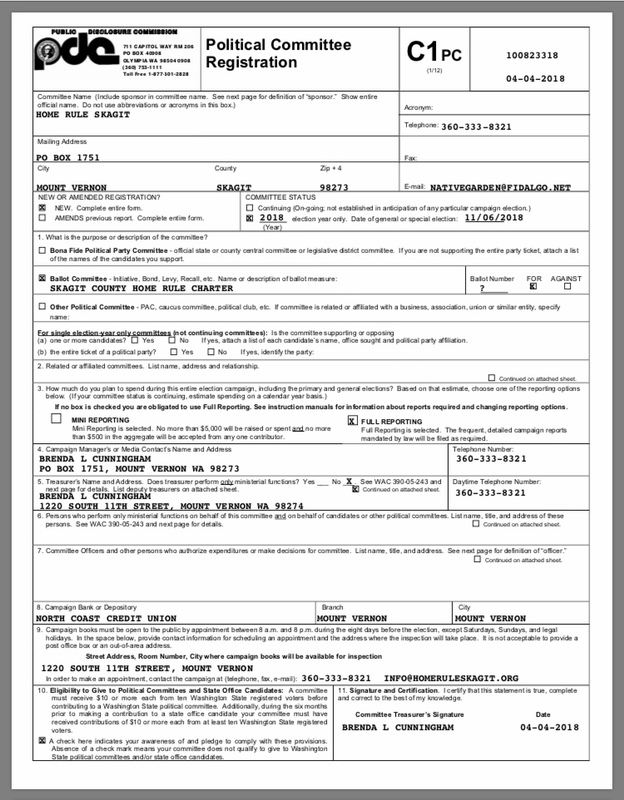 Doddridge’s name is not listed on the No On Charter’s C1pc registration form. Munks concluded the interview by telling The Searchlight Review that he thinks Bruce Ayers and Bill Bruch would typically make decisions about money for the committee, but after saying that, added that he is not sure. Doddridge’s concern he expressed to the La Conner Weekly News reporter about “Indian tribes funding the Home Rule Skagit campaign” seems ironic coming from a man whose net worth is estimated at hundreds of millions of dollars, who has already contributed a combined total of $37,000 to the No On Charter and the Committee to Elect Michael Petrish campaigns, and to the Skagit Republican Party. Posted in Commentary, Information and tagged 40th Legislative District, Bill Bryant, Bruce Ayers, Debra Lekanoff, Donald Trump, Eric Beach, Great America PAC, Home Rule Skagit, Michael Petrish, PDC, Public Disclosure Commission, Rand Paul, Ron Paul, Skagit County, Skagit County Republicans, Tea Party Express, TrumPAC, William Doddridge. Bookmark the permalink.